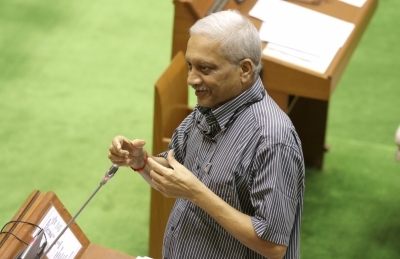 Panaji Sep 14 (IANS) Top BJP leaders and alliance ministers in the BJP-led coalition cabinet on Friday met ailing Goa Chief Minister Manohar Parrikar at a private clinic in Candolim village. The former Defence Minister was admitted to the health facility two days ago. Parrikar -- who earlier on Friday attended Ganesh Chaturthi celebrations at his ancestral home in Parra village located about 10 km from Panaji -- is fine both PWD Minister Sudin Dhavalikar of the MGP and Agriculture Minister Vijai Sardesai of Goa Forward said after meeting the Chief Minister. This is the first time Parrikar 62 has met members of his cabinet as well as top BJP leaders since September 6 when he returned from his third visit to the US where he is undergoing treatment for advanced pancreatic cancer. "His health is good " Sardesai told reporters after meeting Parrikar at the private clinic in Candolim beach village located 15 km from Panaji. Dhavalikar said the Chief Minister was working at the hospital and clearing files. When asked if the alliance leaders had sought a change of Parrikar s leadership in view of the Chief Minister s poor health Dhavalikar said: "He is doing work. When he is doing work where is the question of taking charge." BJP sources also said central observers would arrive in Goa soon to take stock of the political situation in view of Parrikar s illness. The Chief Minister has been recuperating at his private residence near Panaji ever since his return from the US on September 6. He was admitted to the private clinic last week before being admitted a second time two days ago after informed sources said he had developed fever.